4 Friends Club (from College) : Well, first drunk, first missing class without permission, first parents requested at school coz of playing cards at school, and a lots of crazy first, with crazy friends. But, we all got graduated ! M.F.F : This is a code between M.F.F. Club, don’t try to understand, only a M.F.F. knows it! Those friendships are “till death do us part” type. If you are not in this list, it means our friendship is not yet as deep as you think. Sorry! So what do you think? Who am I? They are close friends depsite their differences : Age (8 – 44), Gender (little girl – Overweight man), Location (Australia – New York), Religion (hum … I don’t know – Atheist), Experiences (harrasment at school – attack by a crow) … And although all those differences, they still have a lots of points in common … It’s not a fairy tale. Still, it is a beautiful story, you may even drop some tears sometimes! The Director and Writer Adam Elliot said that it was based on a true story. Actually it was his story : he had a pen friend from Australia for more than 20 years . And, no! It wasn’t a little a girl. 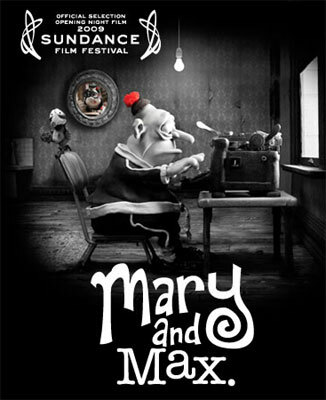 He commented on his piece of Art : “Mary and Max is my new film and it has taken five years to make and cost over eight million dollars with a crew of over 120 people”. But I tell you, you did a damn good job Adam, it’s really worth it! The cast itself show how special this animation movie is : Philip Seymour Hoffman – Oscar winner for “Capote” (Doubt, Charlie Wilson’s War), Toni Collette – Oscar nominated for “The Six Sense” (In Her Shoes, Little Miss Sunshine), Eric Bana (Hulk, The Time Traveller’s Wife). And a big two thumbs up for the soundtrack by Dale Cornelius. Max Jerry Horovitz: [to Mary] You are my best friend. You are my only friend.